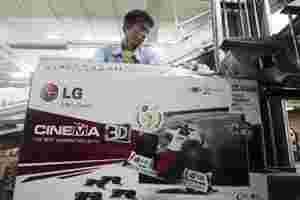 Seoul: Fitch said Tuesday it had downgraded its outlook on South Korea’s LG Electronics, the third such action in a month by an international credit rating agency. Fitch lowered its outlook to negative from stable, citing recent weak operating results and expectations of poor demand in key US and European markets. Fitch said an unrealised foreign exchange-related loss of 110 billion won was another key reason for the weak performance, but added that LG’s mobile handset and flat-panel businesses had also failed to improve so far this year. LG, the world’s third-largest handset maker, is battling to turn around its loss-making handset operations, where it lags Samsung Electronics and Apple in offering high-margin smartphones packed with features. “Continuing subdued economies, mainly in Europe and the US, are likely to lead to weak demand for LGE’s products," it said in a statement. Fitch said it expected LG to slowly improve profitability from next year with a Long-Term Evolution handset, an ultra-high-speed network technology expected to help it win a bigger share of the global smartphone market. In the flat-panel business, over-supply was likely to ease in 2012, Fitch said. Standard and Poor’s last month cut its long-term corporate credit rating on LG Electronics by one notch, citing weak profitability. Moody’s lowered its outlook on the firm’s Baa2 issuer and senior unsecured debt ratings to negative from stable.